This stunning log annex, sitting in the rural garden of a Grade II listed farmhouse overlooking Watership Down in Hampshire, is the home of Sally and Brian Knight. Their daughter Cory and son-in-law Ashley live in the main house, just a stone’s throw away, and the setup could not be more convenient. Generations of the same family living next to each other but with their own front doors and comfortable living space, an ideal solution for downsizing grandparents and their children. Most importantly, the luxury annex was built quickly – but still to the high standards of all Norwegian Log’s buildings – as the family had needed easy-living accommodation, fast and without hassle. Their original plan had been to convert a nearby barn into family accommodation but fate led them down this alternative route. Sally fell seriously ill and was incapacitated for the rest of the year, which forced the family into rethinking its future. Inspiration came from Sally and Brian’s other daughter Kelly, an osteopath who operates from a 25-year-old log cabin that had once been a farm shop, built by Norwegian Log. The family contacted the company and were immediately impressed by the construction, warmth and high standard of finish and realised that living in a Scandi-inspired cabin would be ideal. 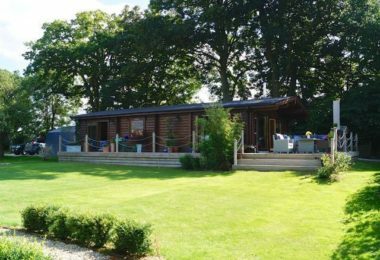 As Elm Farm is listed, Cory and Ashley appointed a planning consultant to liaise with the local authority, with Norwegian Log providing drawings and specifications, as they do with all clients. 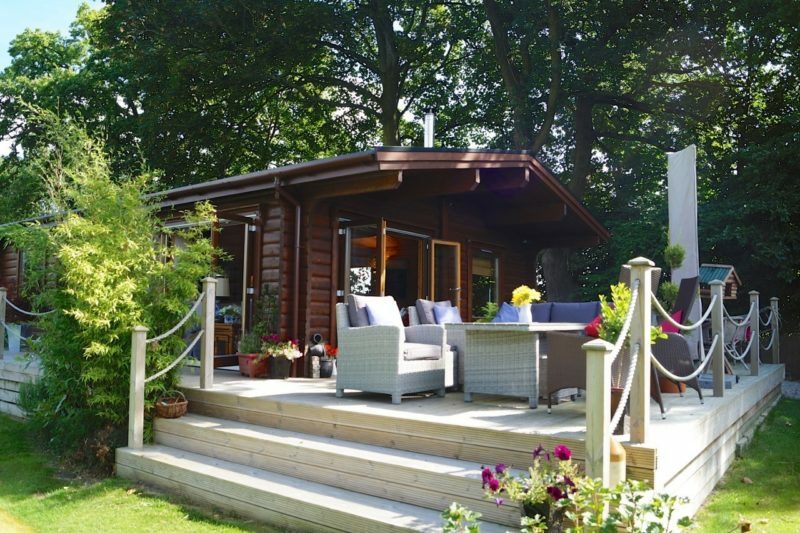 Norwegian Log’s annexes comply with the Caravan Act, so are cleverly classed as transportable. This means they are viewed as temporary structures which gives greater flexibility in planning terms. They are also exempt from building regulations and zero rated for VAT. Permission was granted for the new building to sit on the site of four dilapidated quail rearing sheds. The existing concrete slab forms part of the foundations with individual ‘jack pad’ foundations supporting the building and avoiding the roots of nearby trees that are covered by a preservation order. An overgrown farm track was opened up to provide access for the construction, which is now a full gravel access road to the cabin. 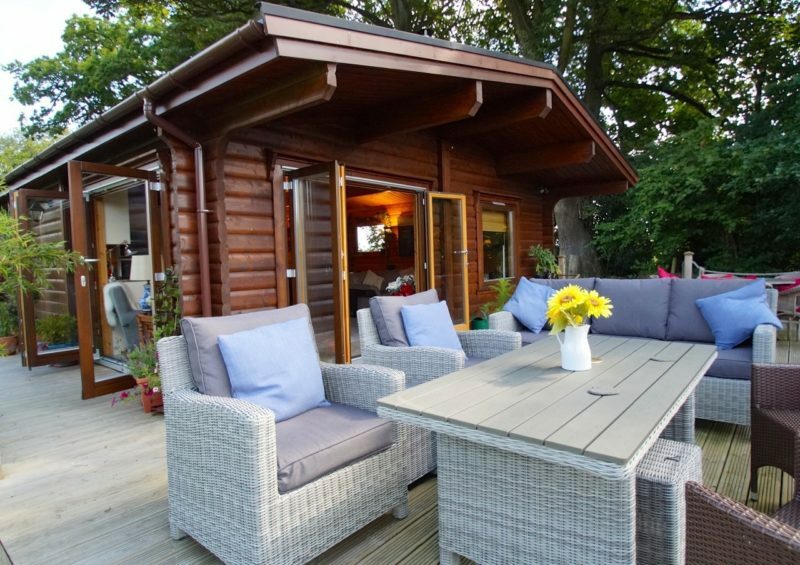 Measuring 12.8m long by 6.2m wide the log cabin annex boasts two bedrooms, a family bathroom, en-suite shower room, as well as a large family room that combines sitting room, dining and kitchen. Ashley undertook the internal fit out which included the electrics, plumbing and the installation of the kitchen, shower and bathroom. The result is a stunning home that is entirely to Sally and Brian’s tastes. Even though the cabin is within shouting distance of Cory and Ashley’s home it feels very private. 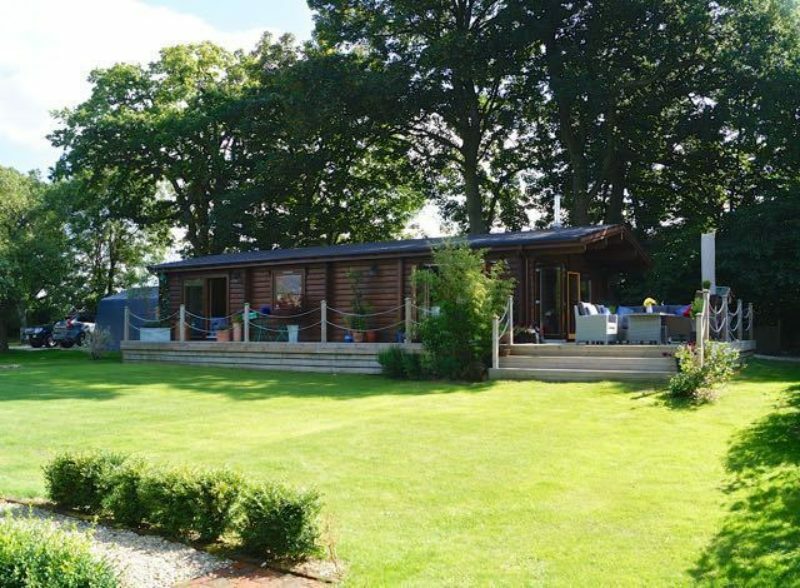 The area around the cabin has been landscaped with generous raised decking where the Knights can sit, feel safe, enjoy the surroundings and watch their grandchildren play.